Tulsa is the #allergy capital of the nation. You wouldn’t believe how many times in a day I hear that! and it makes sense…countless numbers of patients return to Tulsa and find their #allergies are now out of control. But is this really true? 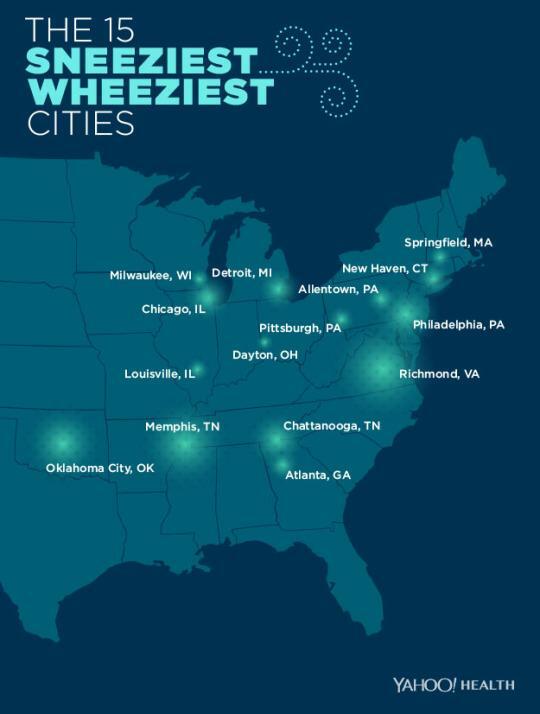 Does anyone even keep track of which city in America has the highest pollen counts and can thus claim to be the most miserable #pollen city in America? If you have nothing better to do, then study the map below to find your city pollen ranking. In Oklahoma, Oklahoma City stands atop the ranking at somewhere between 3rd and 5th almost every year. Tulsa comes in at 10-12th on a very consistent basis, and our sister city Wichita somewhere in between. Generally speaking, the highest pollen concentration in the United States occurs in the northeast with weather patterns influenced by weather patterns coming from the ocean. Mind you, even if you’re ranked 50th in the nation, your state will have exposure to pollen, mold and dust. It’s just a matter of degree. Allergy production (pollen) is a combination of environmental factors such as moisture, wind, barometric pressure and depends not only on your location, but also the particular season. I have previously written about how weather affects pollen, but this year in the Midwest is definitely more extreme than the norm. Plan on mold spore counts to skyrocket with all this water. Time passes when we travel from one city to another even though we’re not aware of the “age factor”. The older you get, the more pollen seasons you’re exposed to and you may develop more allergy regardless of where you live. It’s easy to blame your symptoms on your current location. Irritants are just as important as pollen in causing the symptoms of sneezing, itchy eyes, and runny nose. In an agricultural area such as Kansas, think about the exposure to diesel particles coming from farm equipment all day long during the summer months. What irritant is most prevalent in Tulsa? Ozone. Clear skies, and bright sunlight will lead to ozone alerts with itchy, burning eyes and complaints of allergy. So next time you hear a friend or family member comment about how much allergy we have in Tulsa, remind them that we’re not alone. Misery loves company!